Game night at the Smucker house. 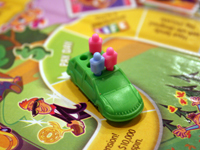 Popular choices recently have been “Ticket to Ride” or “Blockus,” strategy games that I love playing with my kids because I can see their little brains working hard to figure things out. Recently though, they’ve been going with an old standby from my childhood. I loved this game when I was growing up, but after playing it the other night, I’m not so sure. What game could get my attention so much that I’m blogging about it? There’s been a lot of talk in the blogosphere lately regarding the messages our kids take in, thanks to the documentary “Miss Representation.” A few of my friends have posted blogs about it, including a well-written piece by Alise Wright. But not my kids, I thought to myself. We only watch Netflix, so no commercials there. We homeschool (at least until next year), so their influencers make up a short list. Then we played the game of Life. What’s the first thing my 8-year-old son says when my daughter picks out her car and puts her player peg into the driver’s seat? “Okay,” he says, shrugging, clearly thinking that was a rule of the game. “Okay, dad,” she says, happy that her car will now have a driver. Namely, her. There are other things I learned that I don’t like about the game of Life. I don’t like that you can borrow as much as you’d like and pay it back when you finally have enough money. This attitude towards borrowing has made a train wreck of many lives. I don’t like that the game reinforces this formulaic passage without leaving room for alternatives: go to school, get married, have kids, and if this isn’t happening, then you’re left behind. But most of all, I don’t like how the game ends: whoever has the most money wins. Really? Well, we’re not playing that again. But, wait. Why not? Playing that game again, explaining these things to my children that don’t make sense, talking them through some of the ways this game is not an accurate portrayal of life…wouldn’t that be the best way forward? Banning something is rarely effective in curbing its message; in fact, banning things usually only serves to propagate the very messages we are trying to counter. So what diffuses these messages? What did your parents ban from your house when you were young? My mother never banned anything. With our kids we tried to ban Pokemon and similar shows. It didn’t work. The kids on the playground rehearsed the stats and battles so thoroughly that our kids pretty much knew the show forward and back anyway. Kids will learn about quite a lot from their friends, won’t they? Good points, all of them. We’re more the Fireball Island, Forbidden Bridge game types. So we may have to have that “Now Yosi, in real life it wouldn’t be okay to steal another person’s magic jewel so you can avoid the fireballs spewing from that idol’s mouth and get to the canoes before everyone else” talk that every parent has to have at some point. Yeah, I wouldn’t want to be there for that discussion. True on those last points. Banning things works backwards too often. I was laughing a little reading this post in remembering the “culture shock” when my husband and I first married in who got the driver’s seat. In my family, my mom always drove on long trips because my dad has diabetes and if his blood sugar is irregular, it’s unsafe to drive. I was always used to having my mom behind the wheel. But in Zach’s family, not only does his dad drive, but he always takes care of filling up the gas in both his car and his wife’s. My mother-in-law never has had to fill up on gas, as her husband’s way of serving her. But when Zach first offered to take the car for me and get gas…I had to do a doubletake! When I read this, I thought of this question: Do we ban to protect or do we ban to keep our children ignorant? Yesterday we had a similar discussion about Facebook and the rules we set for our 13 year old daughter. We have not banned it, but we have strict rules for its use. One is that she can’t have any “friends” who are men or boys. No male relatives, no pastors, no youth ministers, none. We are not banning men, but we are protecting her from inappropriate comments and relationships. This rule may change as she gets older. Yesterday our nephew was trying to convince our daughter to break these rules. The discussion that followed between her and I about why these rules are there encouraged her to be wise and think critically. And I think it made her feel loved that we risk offending others to keep her safe. If we ban games, social media, books, whatever, and don’t open ourselves up for discussion or teaching opportunities, then our children will not be thinkers, they will just be obedient, at least for a while. I love that game but you’re absolutely right about those subtle (or not so subtle) messages it sends. I’m pretty sure my pink peg was always the driver, however. Didn’t even think twice about it as a youngun. I’m very pro-discussion. Banning something can serve to make it more enticing. My parents heavily regulated the movies and tv shows we could watch as kids, which only made me want to watch them more. If my parents had sat through a few episodes of 90210 with me and then talked about the ramifications of Brandon’s choice to spend time with Emily Valentine, I’m pretty certain I would not have ever wanted to watch the show ever again. The sheer mortification- ah, but also the lessons that could have been gleaned. You should take a look at “The Game of Real Life.” They tried to make it a bit more realistic. I wouldn’t recommend it for kids though. Your character can contract an STD or get addicted to drugs. We had a few things banned at our house (mostly movies that we weren’t old enough for yet), but we were also “encouraged” to play games like Count Your Blessings (a Christianized Monopoly-like alternative), where you could acquire properties and charge people for landing on them, but you were also often given opportunities to choose between taking money or getting “blessings.” I’m not sure it really taught us much because you had to have a certain number of blessings (and a salvation card!) to win, so essentially we just treated the collection of blessings like the collection of money. It would, honestly, tire my fingers out to write the list of things that were banned by my parents! !